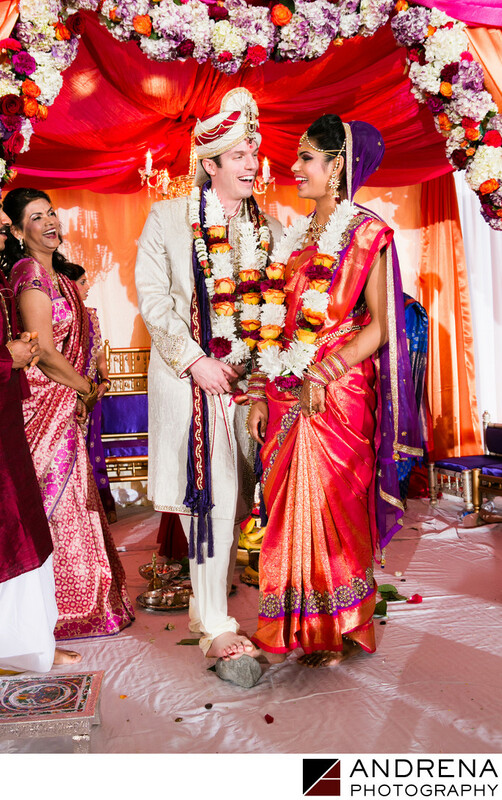 I love when couples experience true joy during their Indian wedding ceremony, as was this case during this wedding at the Ritz-Carlton in Washington, D.C. While ceremonies in Southern California are often outside, indoor ceremonies are the norm in certain areas. The use of proper lighting helps ensure that skin is properly illuminated and that images don't look muddy. This was actually a fusion wedding, including both a South Indian ceremony and a Christian ceremony. You would never know it, but the bride was actually very sick with a bad cold throughout her entire wedding. She was able to rally, though, and she looks happy and well in all of her wedding images. I loved working with this sweet couple. Indian wedding photographed at the Ritz-Carlton in Tyson's Corner, Virginia, near Washington, D.C.